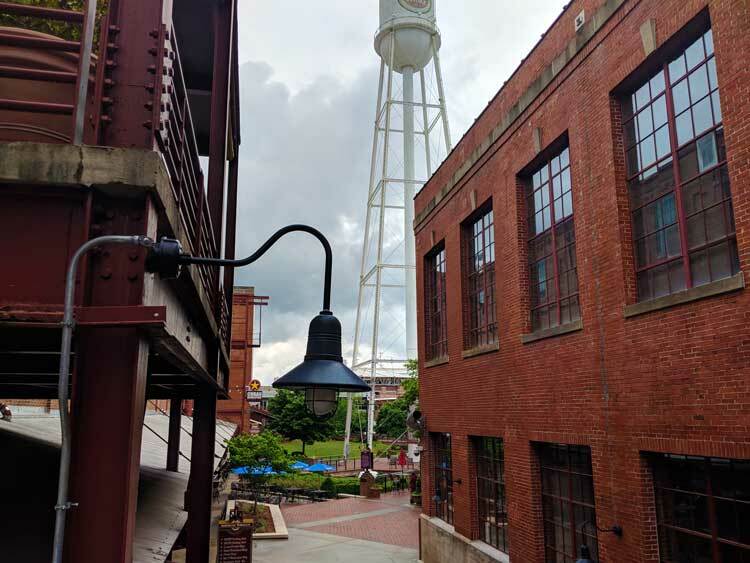 The zZounds crew is in Durham, NC for Moogfest 2018 — the annual music, art, and technology festival honoring the legacy of synthesizer pioneer Dr. Bob Moog. 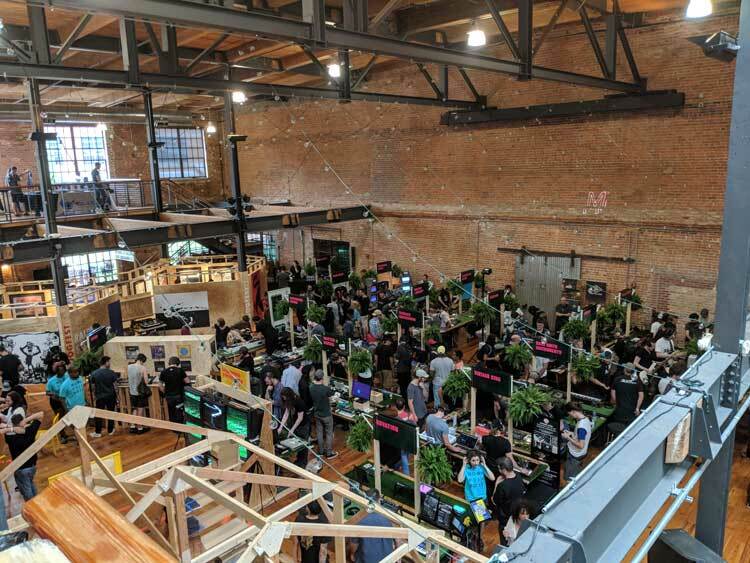 There’s so much to see and hear at this four-day festival — with electrifying live performances, hands-on workshops, the Modular Marketplace, and much more, it’s a synth geek’s dream come true! 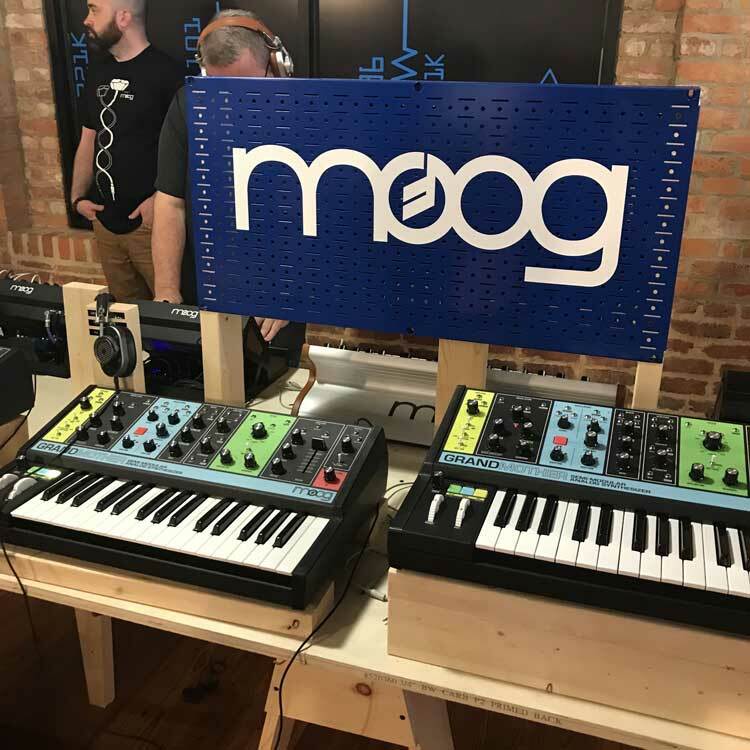 Join us as we connect with artists and tech enthusiasts of all stripes, and check out our photo gallery for the sights of Moogfest 2018 — from the Ralph Steadman art gallery, to a first look at the Moog Grandmother semi-modular analog synthesizer. For more information about the Moog Grandmother synth, please email us or call 1-800-ZZOUNDS. 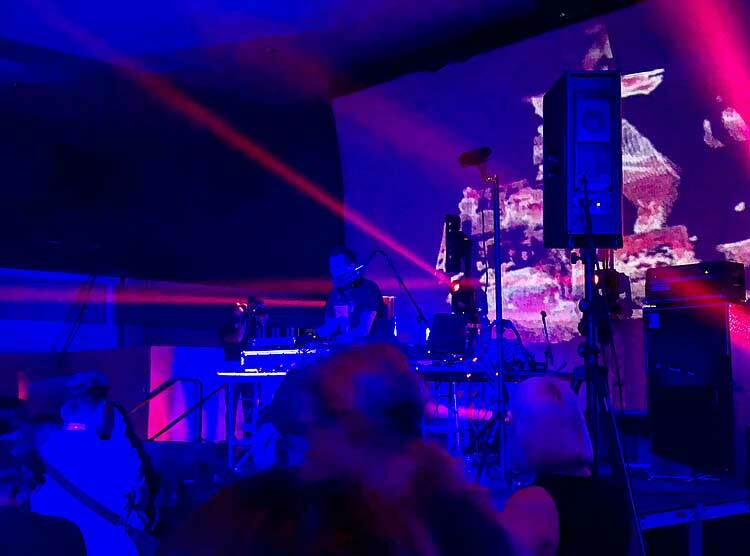 The first night of Moogfest 2018 featured a set from industrial metal artist Author and Punisher. 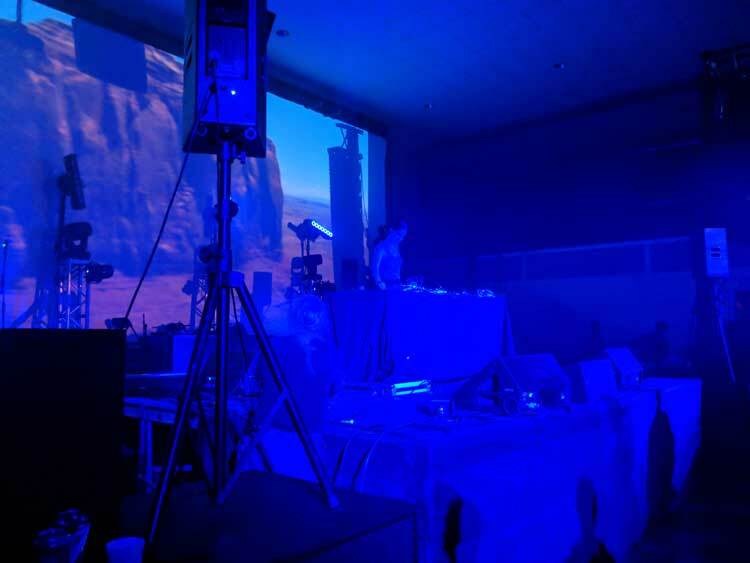 At The Armory, A&P performs surrounded by his handmade machines that function as MIDI controllers. 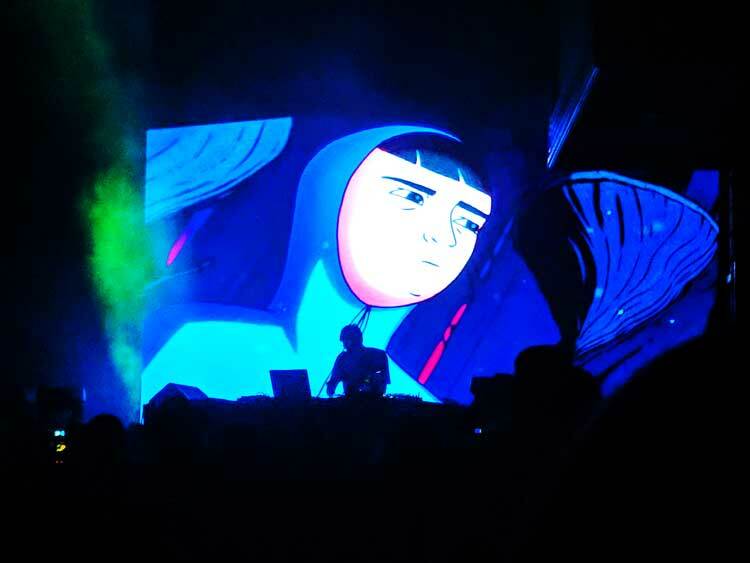 German DJ and producer Helena Hauff performs at The Armory. 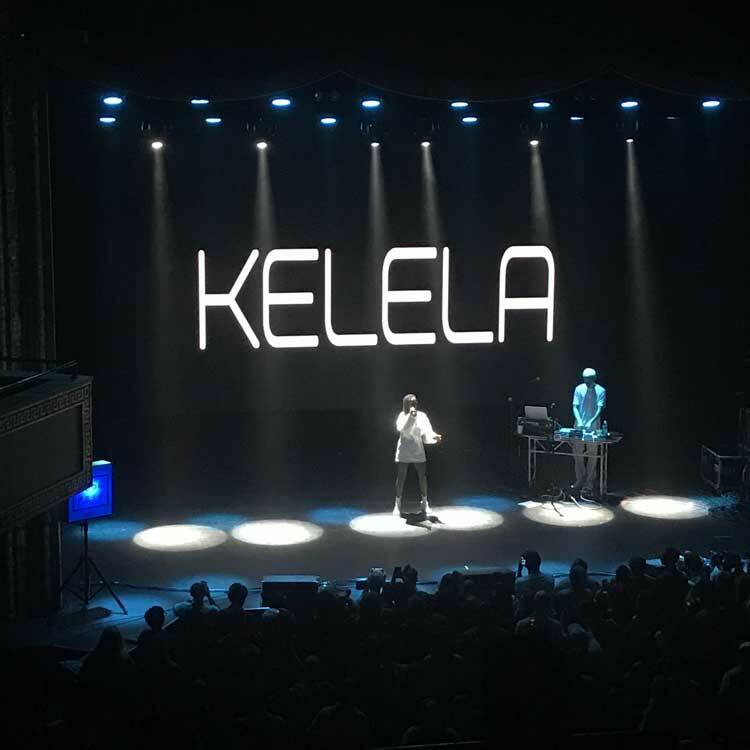 Moogfest headliner Kelela at the Carolina Theatre. 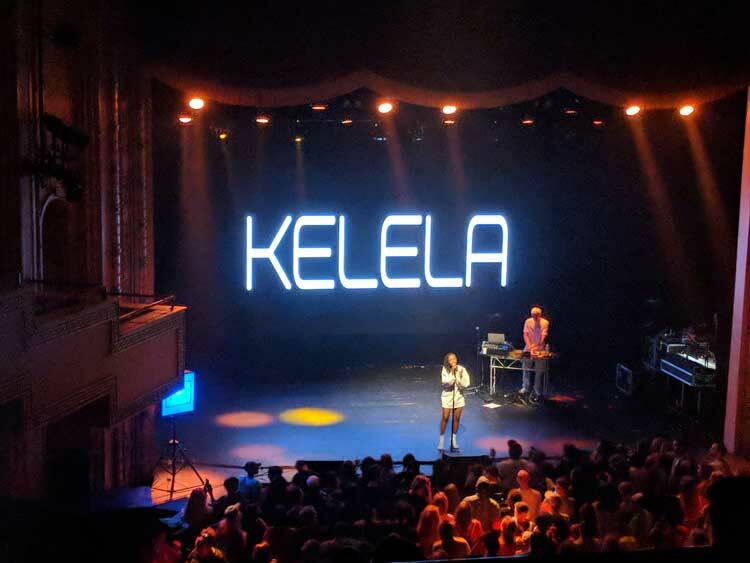 The Ethiopian-American singer/songwriter regaled the audience with her alt-R&B and electro sounds. 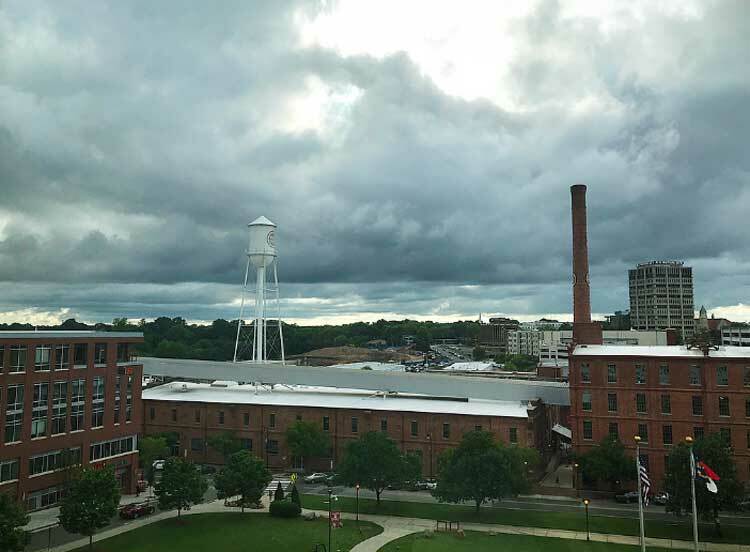 Durham’s historic American Tobacco Campus, complete with Lucky Strike water tower. 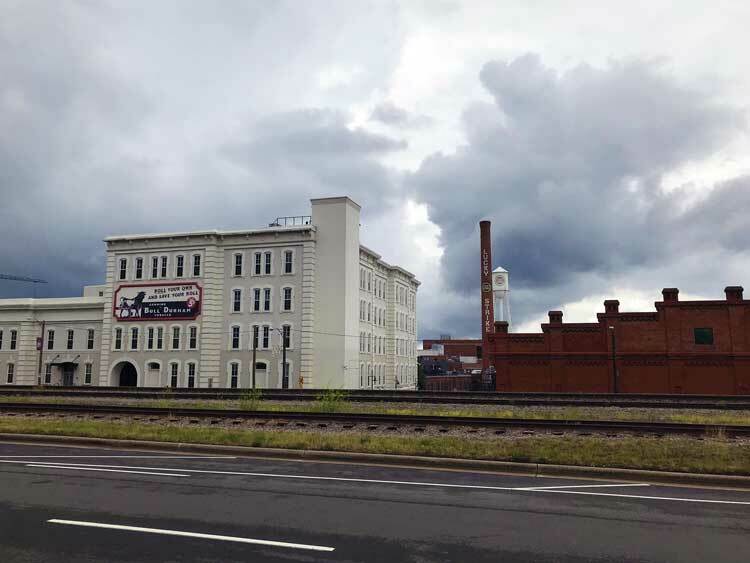 The Tobacco Campus is downtown Durham’s entertainment district. 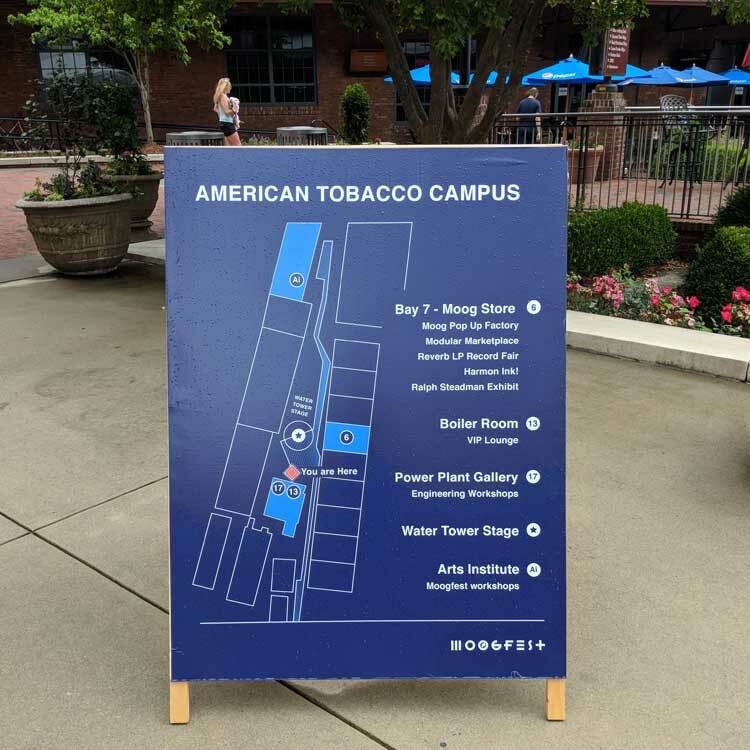 This weekend, the Tobacco Campus is home to Moogfest. 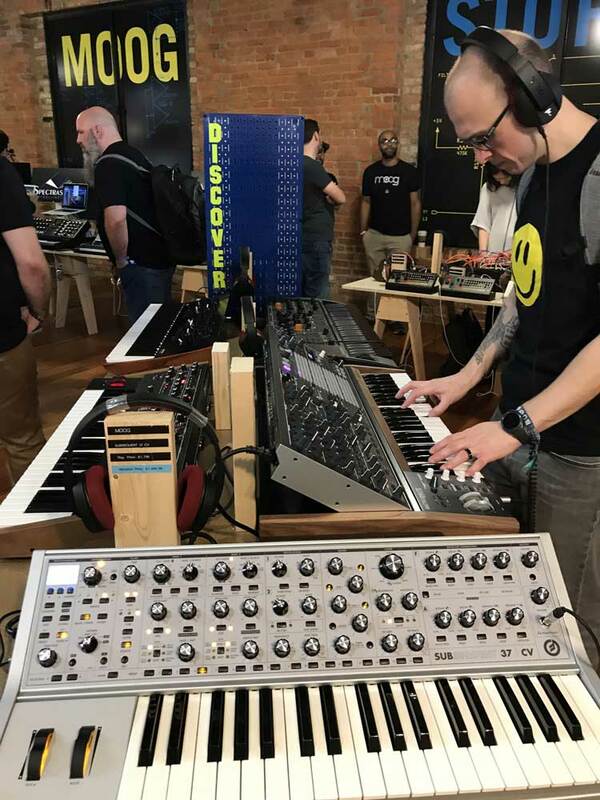 Gear vendors from all over the world set up shop here at Moogfest’s Modular Marketplace. 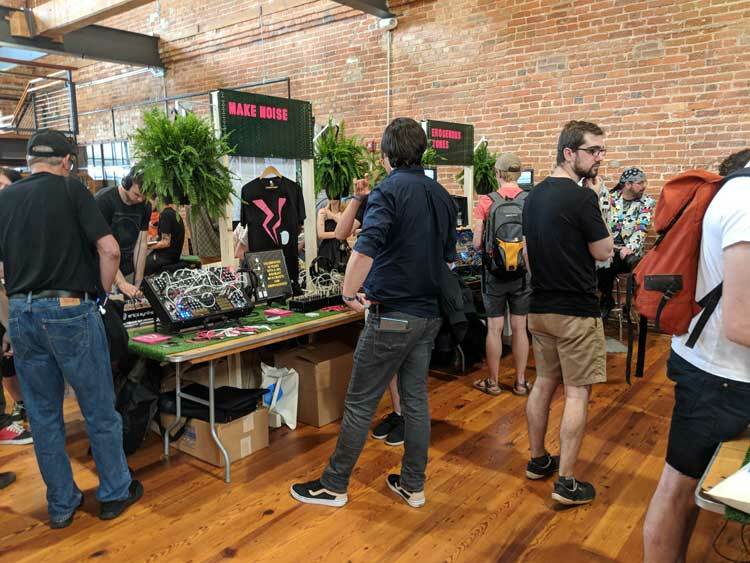 Dozens of vendors show off their wares to the synth-savvy Moogfest crowd. 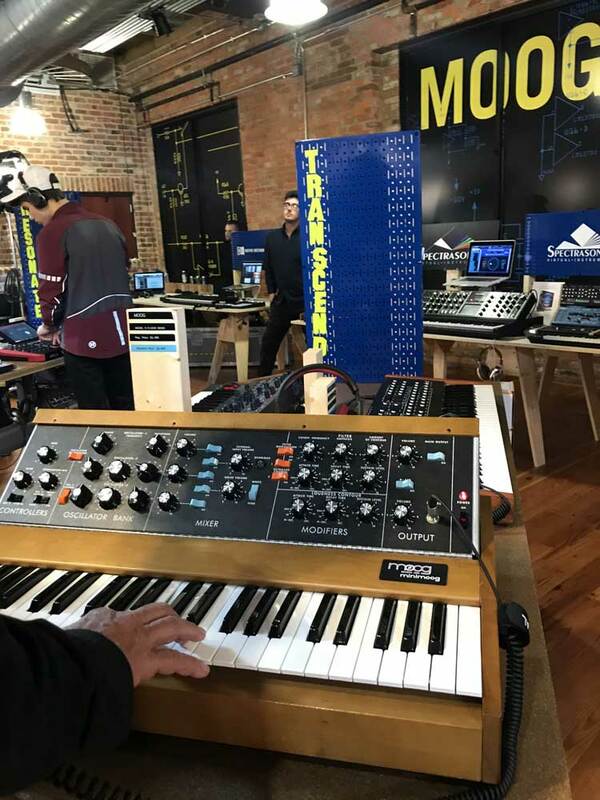 There’s a booth from Make Noise, makers of synth modules and neighbors to Moog Music in Asheville, NC. 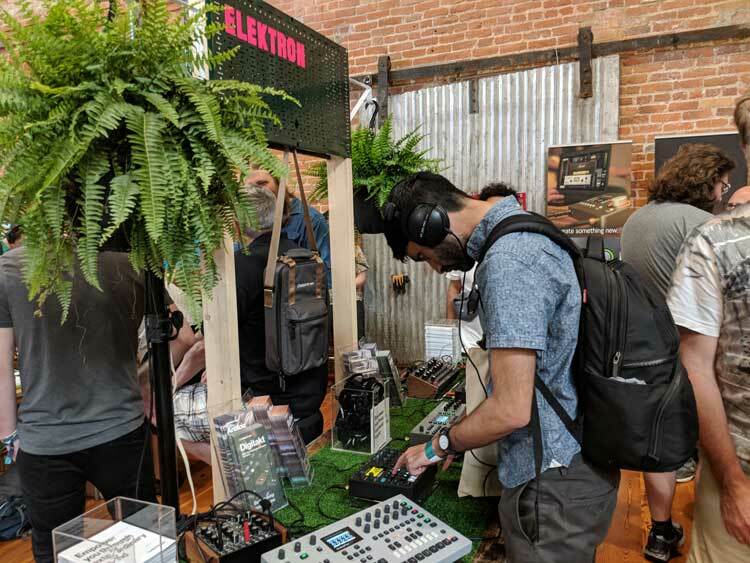 At Swedish synthmaker Elektron’s booth, Moogfest-goers try out the Digitone desktop FM synth. 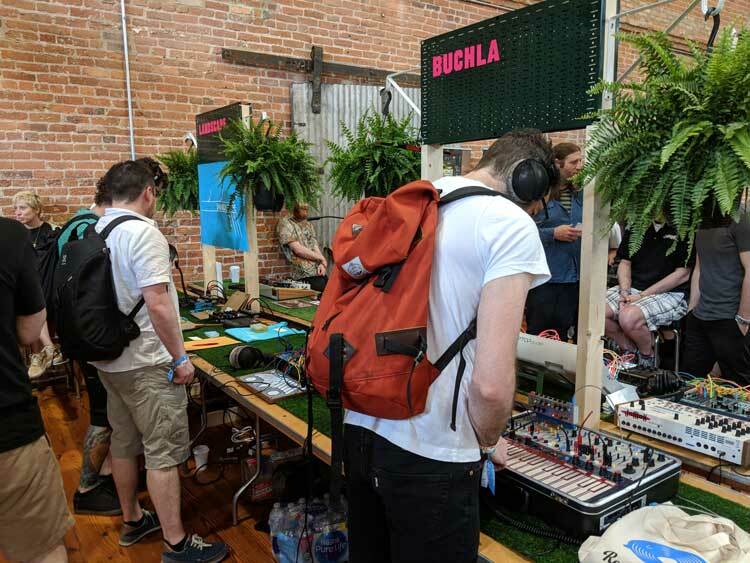 Moogfest attendees get their hands on electronic instruments from Buchla, Landscape, and many more. 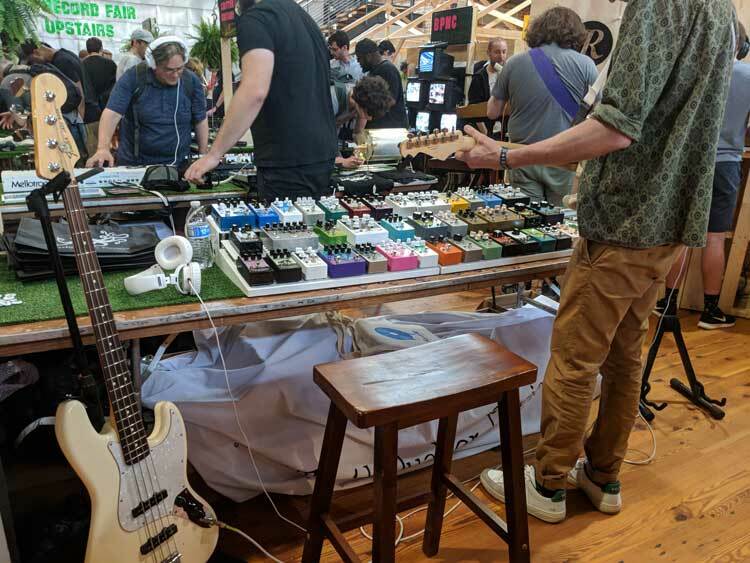 Even EarthQuaker Devices is here at Moogfest — with all their unique effects pedals ready for you to try out. 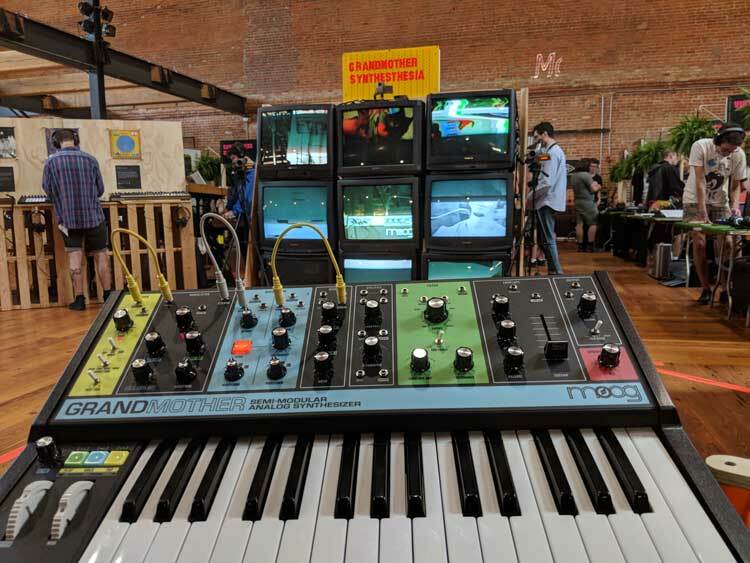 It wouldn’t be Moogfest without Moog synthesizers — like this limited-run Minimoog Model D reissue. 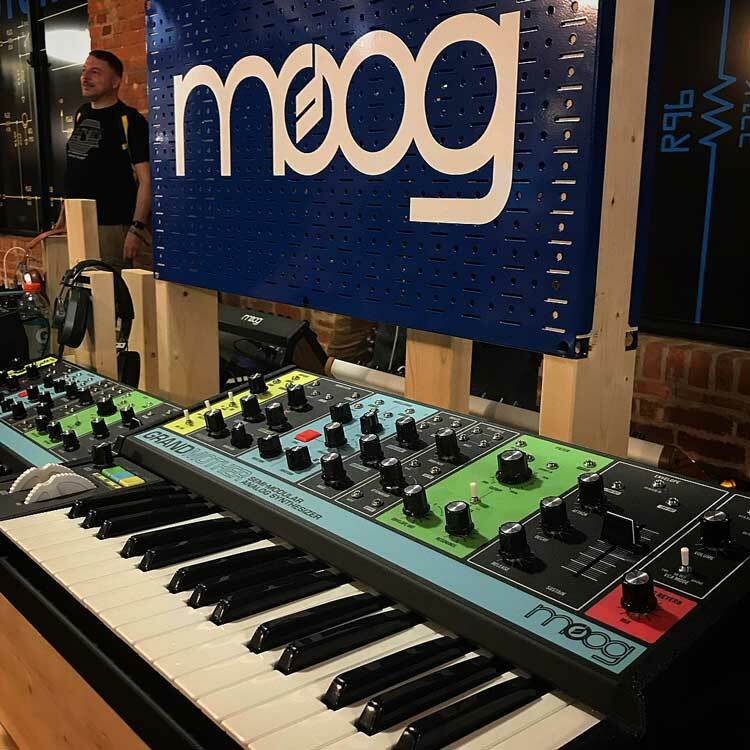 The limited-edition Subsequent 37 CV synthesizer is back after making its debut at Moogfest 2017. 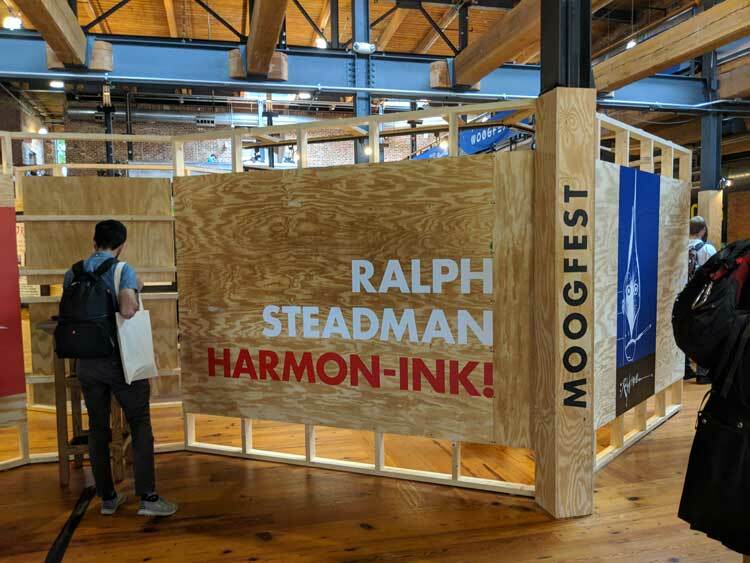 Moogfest is a feast for the ears and eyes both — with an exhibit of illustrator Ralph Steadman’s distinctive art. 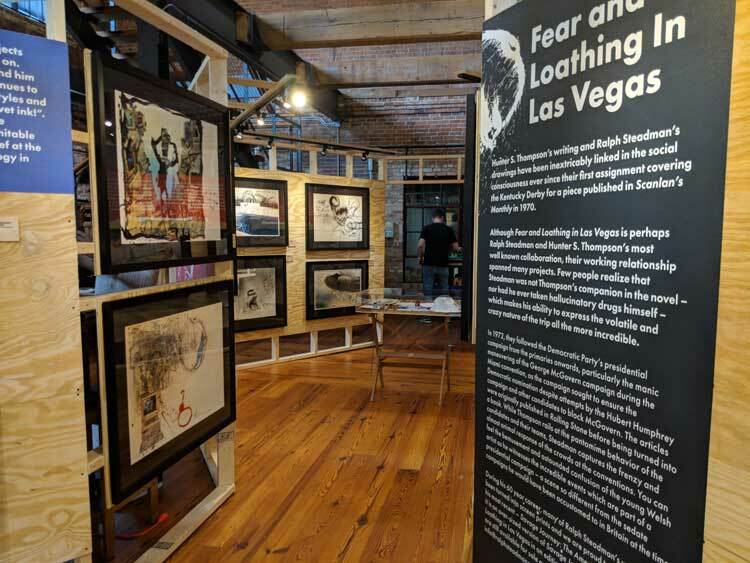 You know Steadman’s work from his many collaborations with author Hunter S. Thompson. 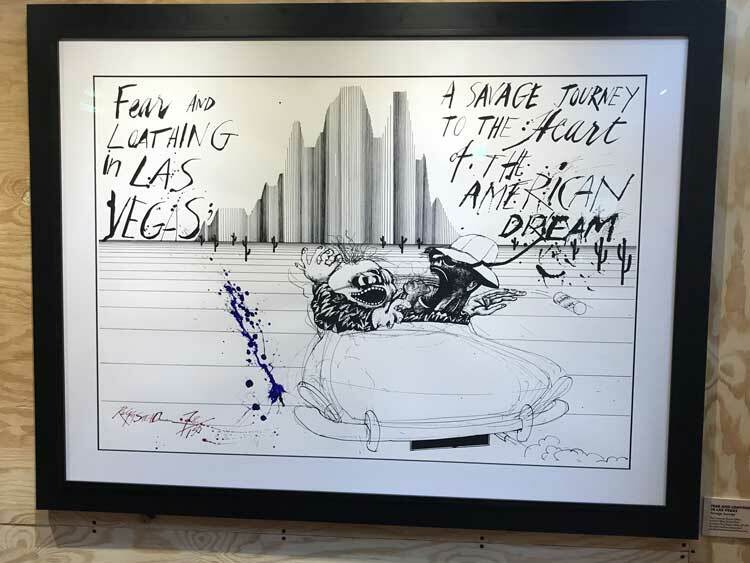 Steadman’s artwork, including a series of Fear and Loathing in Las Vegas illustrations, grace the walls. Don’t be late for class! 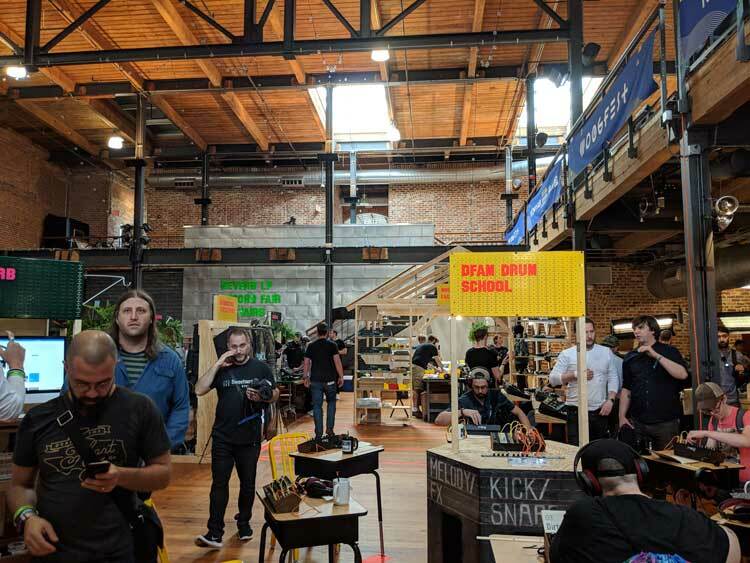 Moogfesters with an Engineer Pass get VIP access to this synth-building workshop. 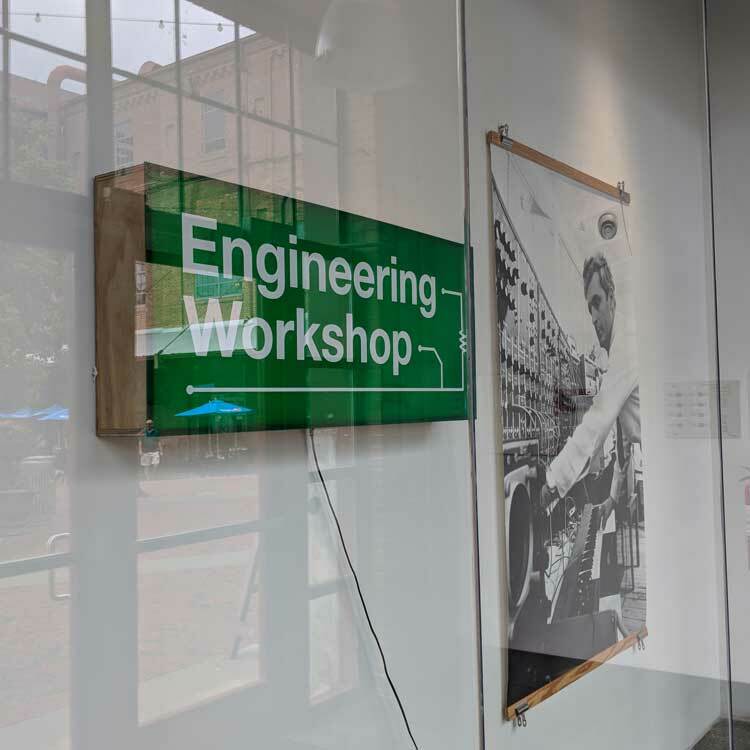 At Moogfest’s Engineering Workshop, fest-goers learn to construct a Sub-Harmonicon synth from scratch. 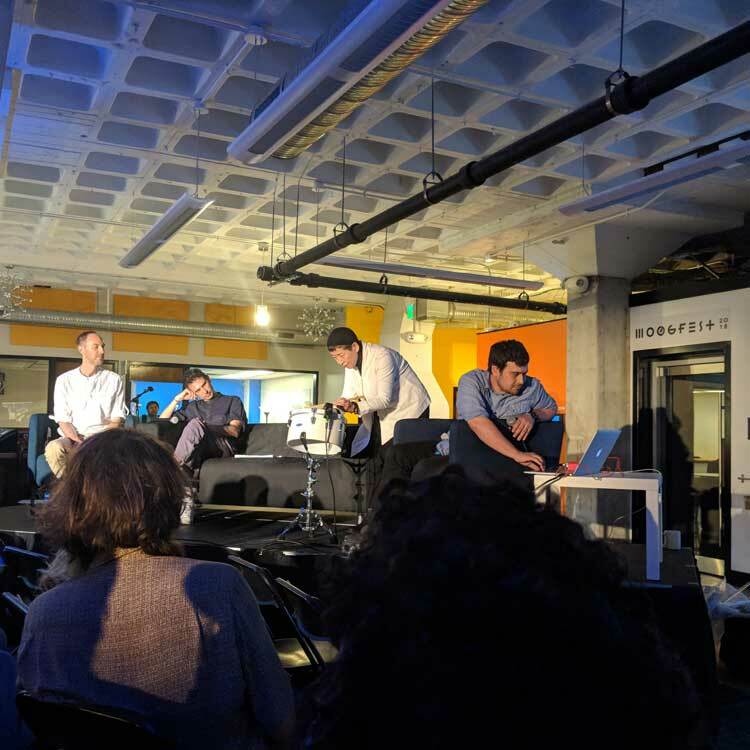 Japanese composer and percussionist Midori Takada gives a masterclass prior to her Moogfest performance. 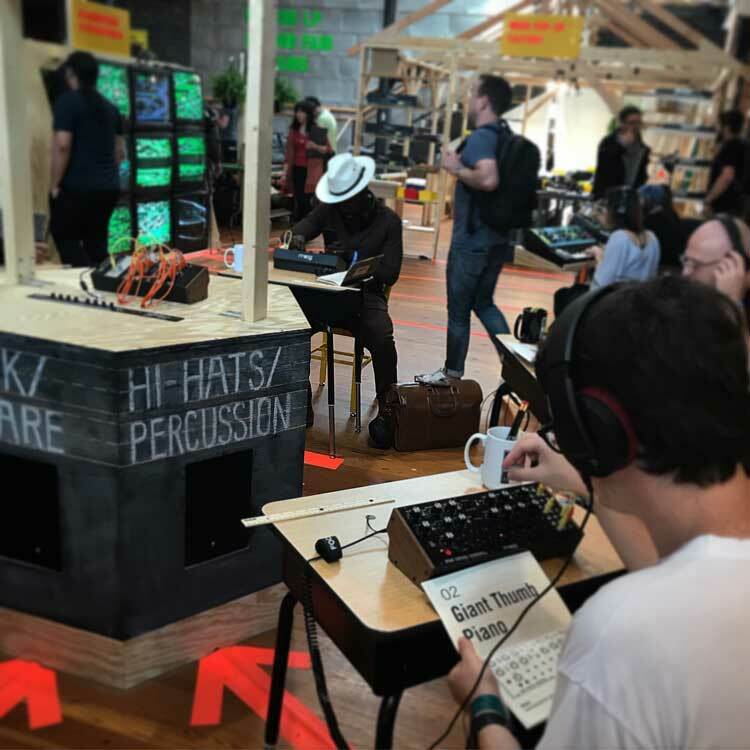 In this electronic drum circle, fest-goers get their Moog Drummer From Another Mother synths to jam together. Moog’s latest instrument, the Grandmother analog synthesizer. 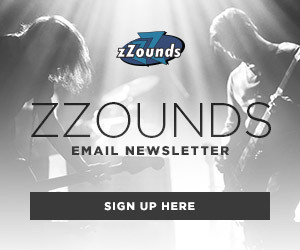 Call us at 1-800-ZZOUNDS for more information. With a look that hearkens back to the Moog Rogue, the Grandmother boasts 2 analog oscillators and 32 keys. 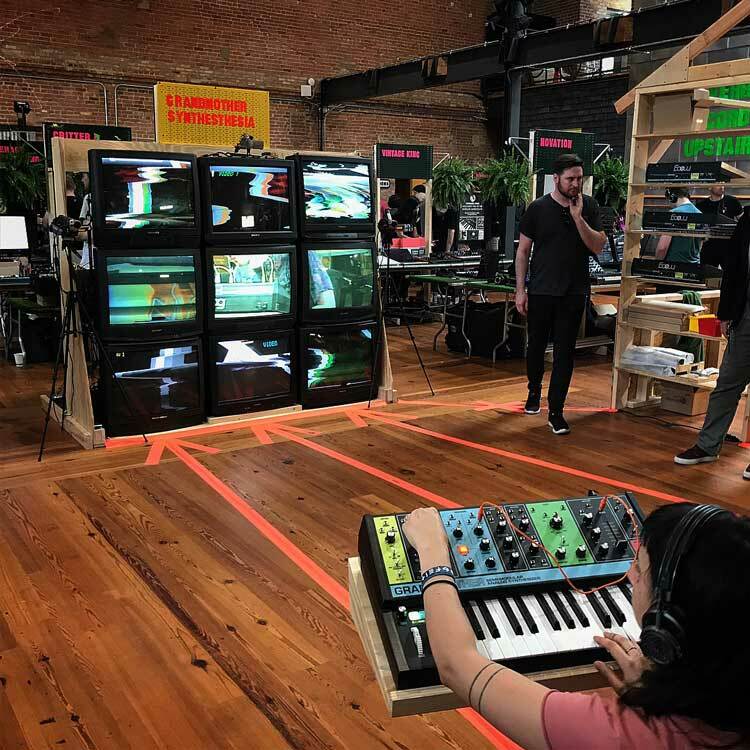 This video wall is being controlled by three Moog Grandmother synthesizers via the CV output. 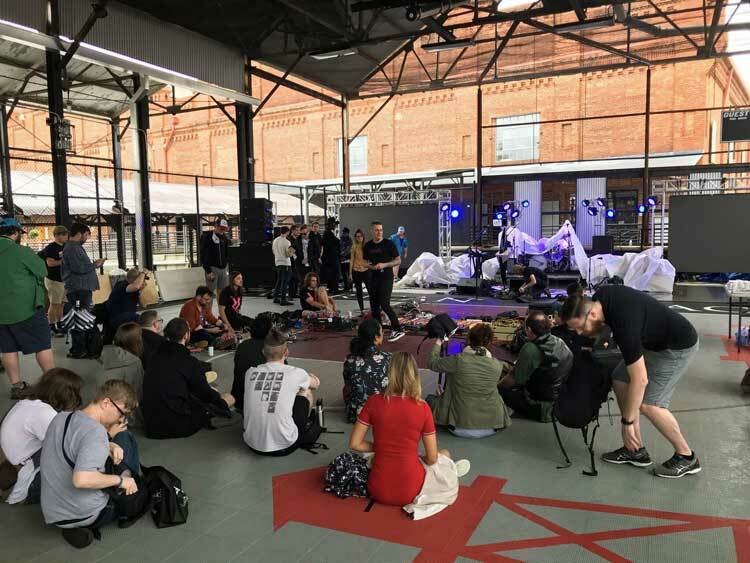 Moogfest-goers get their hands on the Grandmother and start making noise — no patching required. We’re digging the retro vibe of the Grandmother! 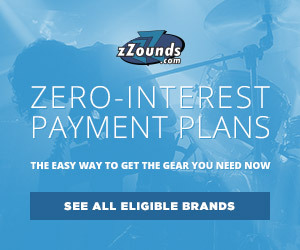 Call us at 1-800-ZZOUNDS for more information. 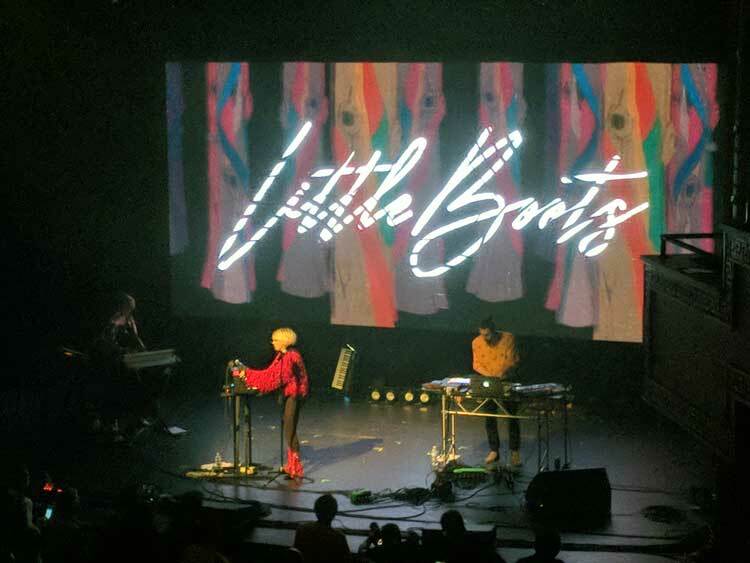 English electropop songstress Little Boots performs for the Friday night Moogfest crowd at the Carolina Theatre. 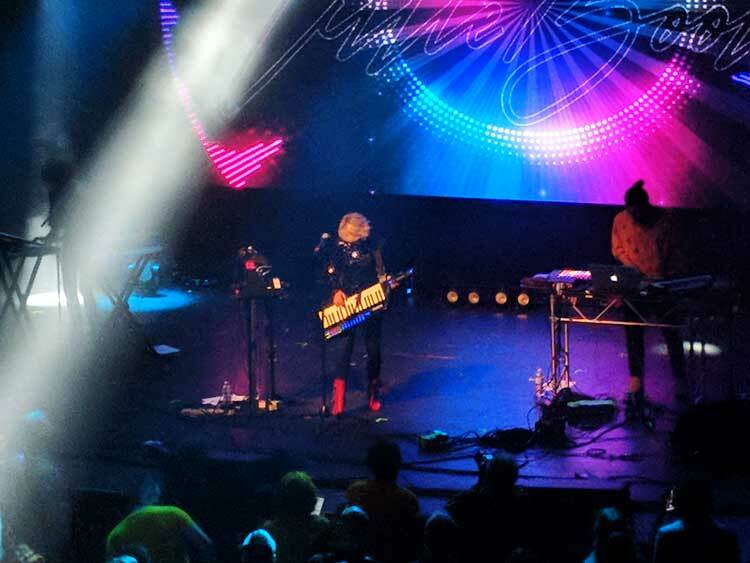 Electronica artist Little Boots wields the Alesis Vortex 2 Wireless keytar MIDI controller at her Moogfest set. 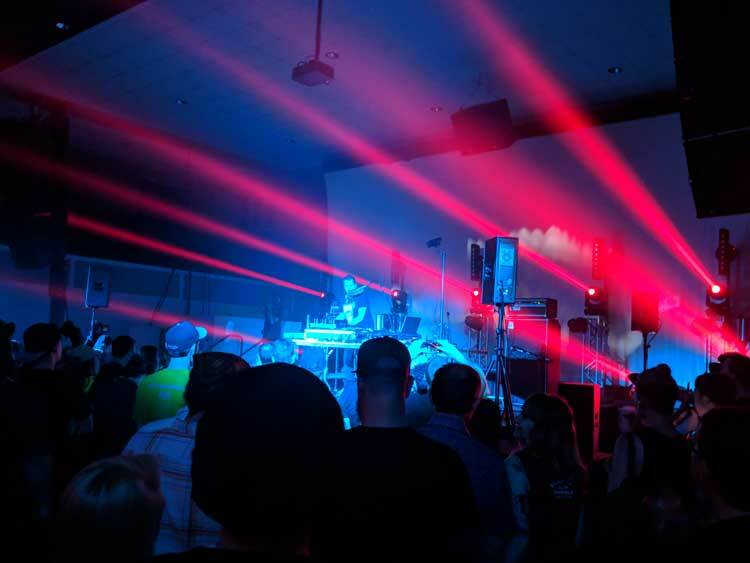 Moogfest 2018’s Friday night headlining act: English electronica producer Jon Hopkins. 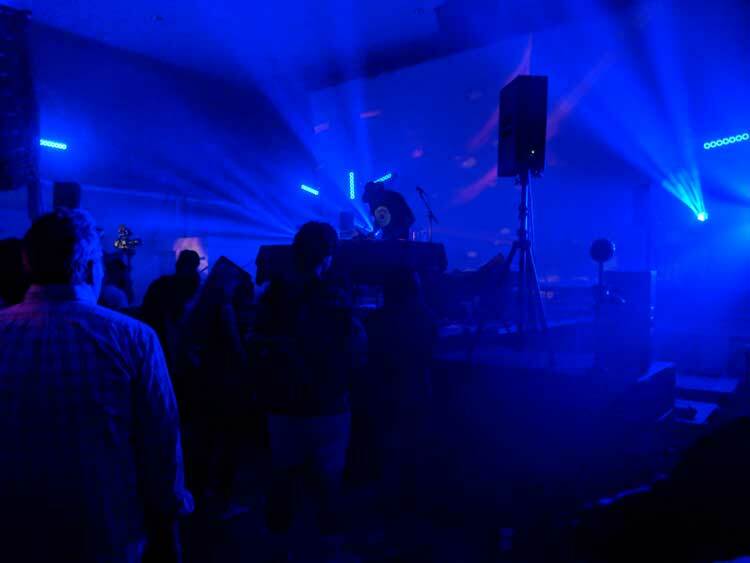 Detroit-born DJ/producer Waajeed takes the Moogfest crowd for a trip at The Armory in Durham. A tent kept the rain away for this free outdoor performance from rapper Ali Shaheed Muhammad and DJ Pete Rock. 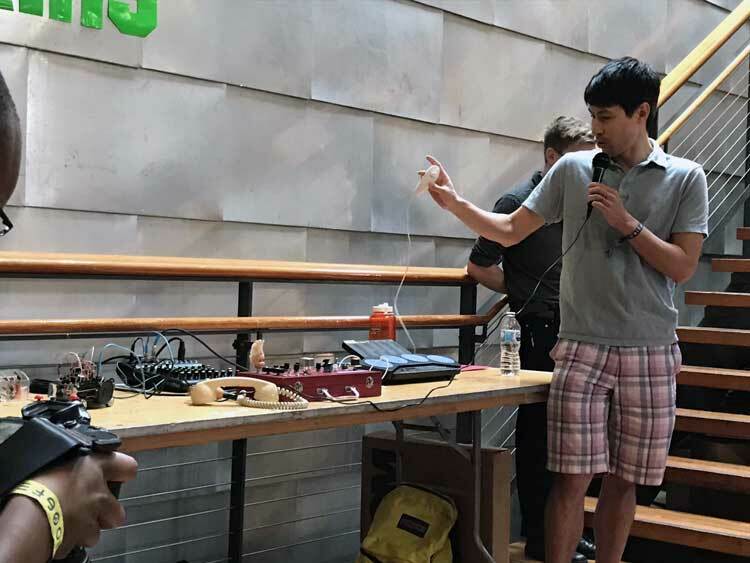 It wouldn’t be Moogfest without a circuit-bending contest. 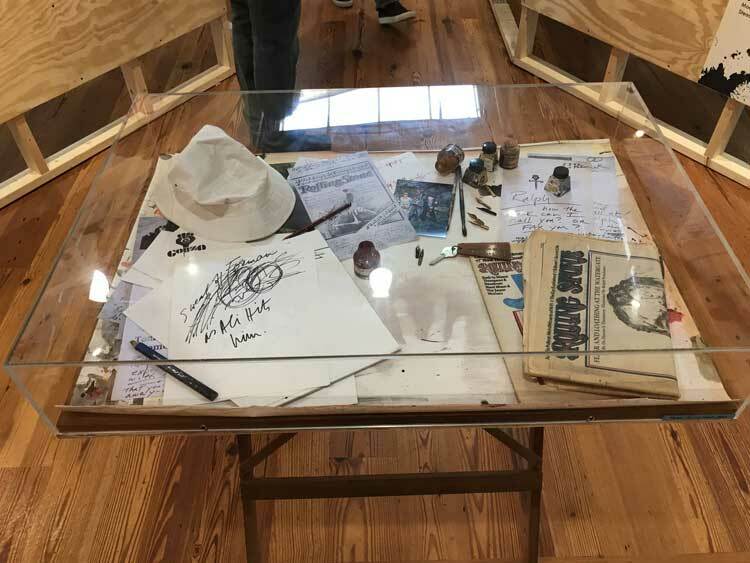 Here’s what that looks like. 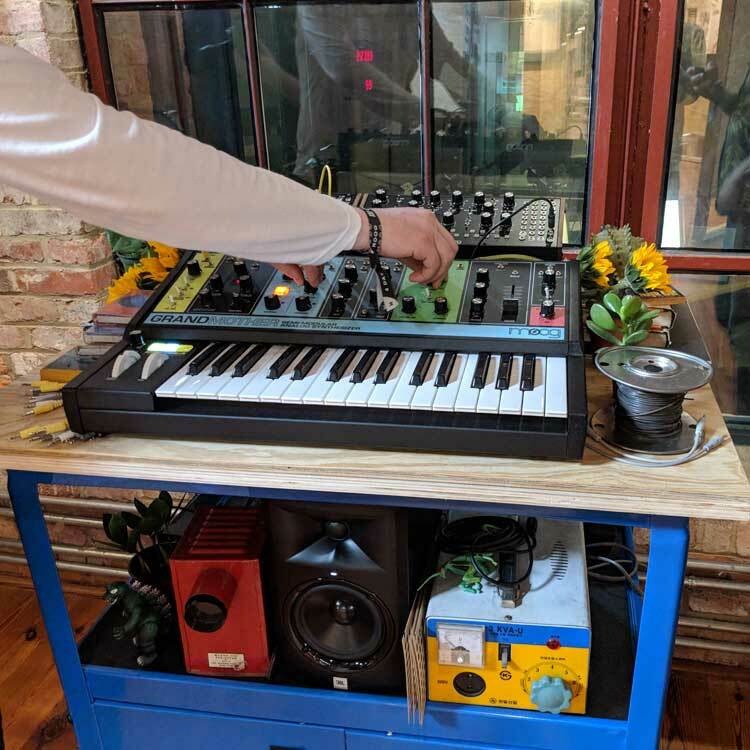 Here’s a look at a finished Subharmonicon — the semi-modular analog synth that Moogfest-goers built in the Engineering Workshop. Gibson Announces 2018 Billie Joe Armstrong Les Paul Jr.